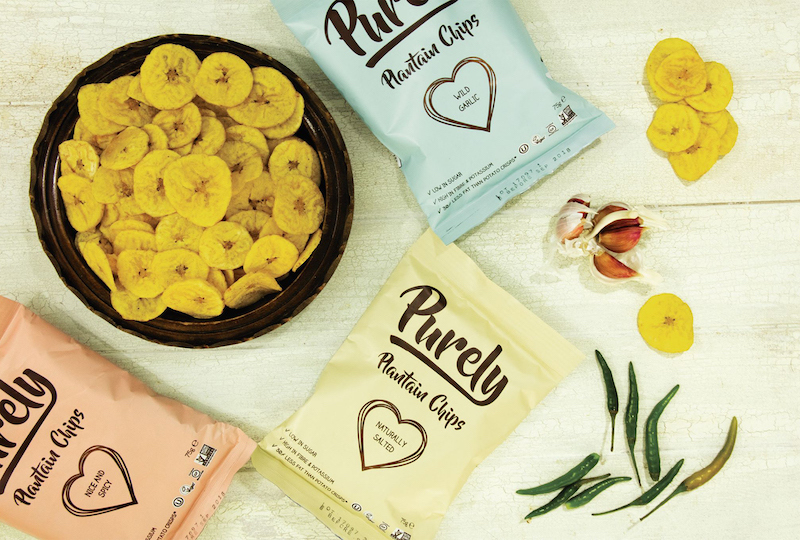 Read how former languages student Stefania Pellegrino was inspired to make plantain mainstream in the UK after trying them in Ecuador – and how she got her brand, Purely, into Selfridges. I have itchy feet and an inquisitive nature, two traits well suited to a food entrepreneur who’s on a personal mission to raise the profile of better-for-you snacking with an ‘authentic International Cuisine’ leaning in the UK. Born in Puglia, Italy (so a bona-fide pug) I’m an international business and languages student who originally won a secondment on a European jobs programme to Wales, where I joined a bustling marketing department tasked with championing women in business. Six months down the line, my first loves of language and travel led me to BanaBay, a fresh fruit import and export business with enviable ties to South America. Snaffling plantation chips in an Ecuadorian café thinking ‘why don’t more people know about these?’ Bananas, plantain’s showy cousin have been a fruit bowl staple for ever and a day whilst fulsome yet understated plantain has humbly stayed under the ‘snacking radar’ UNTIL NOW! One of my strengths or weaknesses (depending on your perspective) is once an idea pops into my mind I genuinely struggle to get it out of my head. I started wandering around top end delis and food emporiums and discovered that although a couple of plantain brands did exist, their ambitions were limited, playing to an already committed ethnic niche. My vision was to take plantain to the mainstream, giving both traditional potato and dubious extruded monstrosities a run for their money, whilst providing emphatic proof that great taste and a healthier living mindset can happily walk hand-in-hand. It all started rather positively with our first container arriving in November 2017. We were insistent from the outset that the brand must stay true to its roots and support the local economy which is why the entire operation from the raw crop to the slicing, frying and packaging of plantain takes place with an expert Ecuadorian production crew. We also wanted to align Purely with the enviable ‘clean living’ movement that’s finding its voice in the UK. From day one it’s been imperative that we appeal to the discerning vegan, free-from, low sugar and kosher audiences. 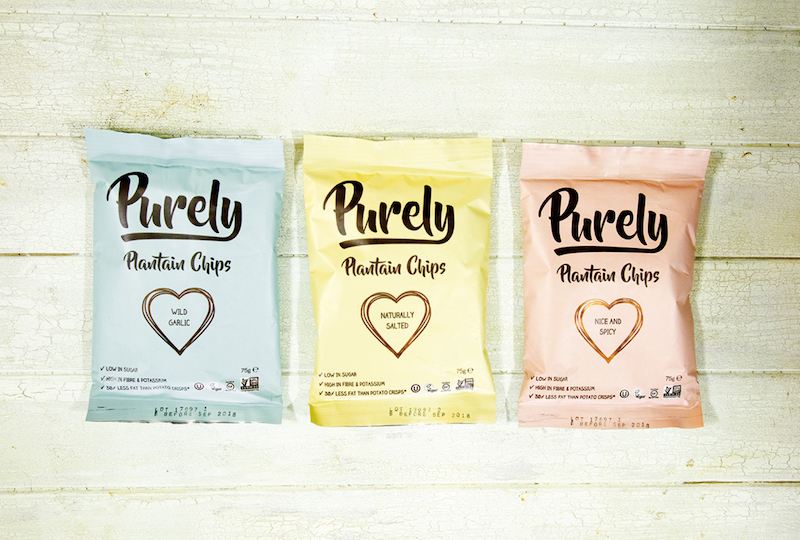 We’re especially proud of our ‘30% lower fat footprint than traditional potato crisps’ stance, although we will never skimp on taste in our bold quest to win over this increasingly influential and knowledgeable foodie audience. We always suspected that the UK food market would be challenging but were initially a little taken aback by just how tough it is to get even the slenderest foot in the door regarding the all-powerful buyers. Our ‘step change’ break came when we won a Planet Organic pitching competition which led to our first listing being more top drawer than we ever could have hoped. A ripple effect was now very much in place with Harvey Nichols and Selfridges quickly following Planet Organic’s lead in conjunction with our blossoming independent food store presence (delis, food halls, health food shops, upmarket cafes and forward-thinking bars). This January sees yet another significant stride with Fortnums welcoming us with open arms to their super premium snacking fixture). There’s life outside potato chips and traditional fruit nibbles. Here is a fruit with a savoury leaning, a good-for-you bite (brimming with beneficial fibre, potassium, magnesium and vitamins A/B6) that’s quite simply at its happiest pairing with a number of the UK’s most treasured herbs and spices, be that a generous pinch of garlic, something altogether spicier or simply a light smattering of salt. It’s interesting to see how our different flavours resonate with different audiences. 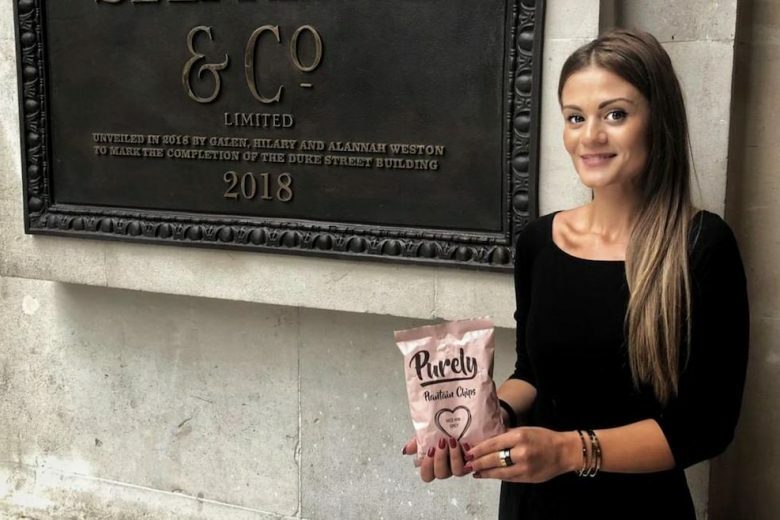 Lightly salted is our ‘hero’ line within the health food fraternity, the on trade lean towards spicy whilst during event season its garlic that leads from the front in terms of sales. Marketing has been restricted thus far however now we have a genuine success story to tell we’re starting to engage with food editors (PR) whilst gradually ratcheting up our social media profile. The local Birmingham press (for example, Birmingham Business Mag) has been truly supportive of our bigger vision which is fantastic because building a local heartland is central to our longer-term ambitions. Best of all, our award-winning brand is well-equipped to stand on its own two feet, which is why we love the events and exhibition circuit which has been so central to spreading the word. Many more to come but wandering into Selfridges to see our proud packs calling out from the shelves was certainly a ‘truly chuffed’ starter for 10! Health conscious 25-35 year old females looking not to disappoint their taste buds in their ongoing quest for tasty yet healthy snack salvation. This said we have big plan to do our bit for health conscious kids in the future and our bar/gastro pub/discerning hotel journey has a lot further to travel. If you’re not nervous from time to time you’re clearly not pushing yourself hard enough! You can read more about Purely on their website.